The moment had arrived. It happens once every two or three years, but when it hits me, something must be done fast. You see, I’m pretty cheap when it comes to caring for myself. I make my own shampoo, conditioner, lotion, face wash, etc. partly because I like being as natural as possible, but the main driver is saving money. That’s the same reason I never get my haircut. (There might be some laziness in there too.) I see my sister-in-law twice a year and each time she gives me a little trim. It doesn’t help that my hair grows super fast, especially with these prenatal vitamins I’ve been taking for the last year. Although I love my long hair and saving money by avoiding cuts, there always comes a time once every two or three years that I can no longer stand the length and frantically start trying to schedule a chop. I’m not sure if it was from Silas constantly clamping on to my hair, his spit up in it, or just the additional time it takes to wash and dry when time is more precious than ever, but two weeks ago I knew the time was now. 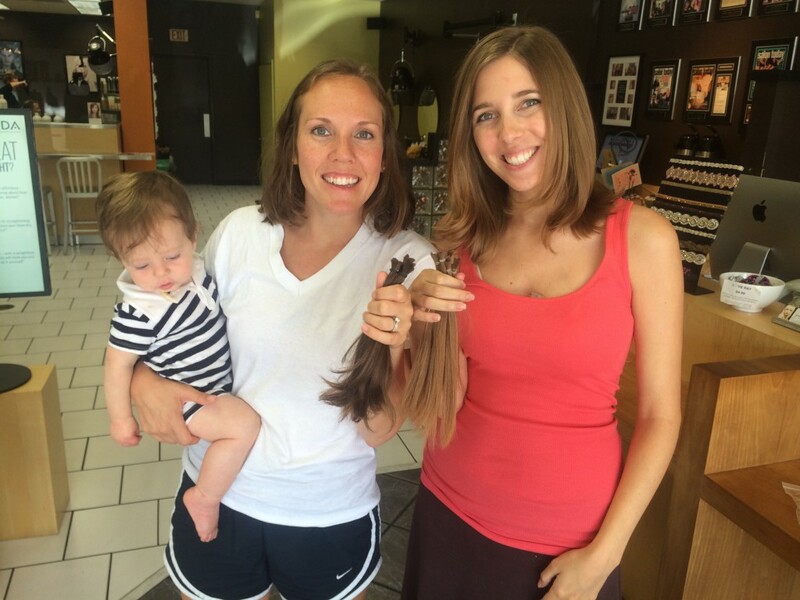 I reached out to my friend, Annie, who had expressed interest in chopping her hair recently. She was in! 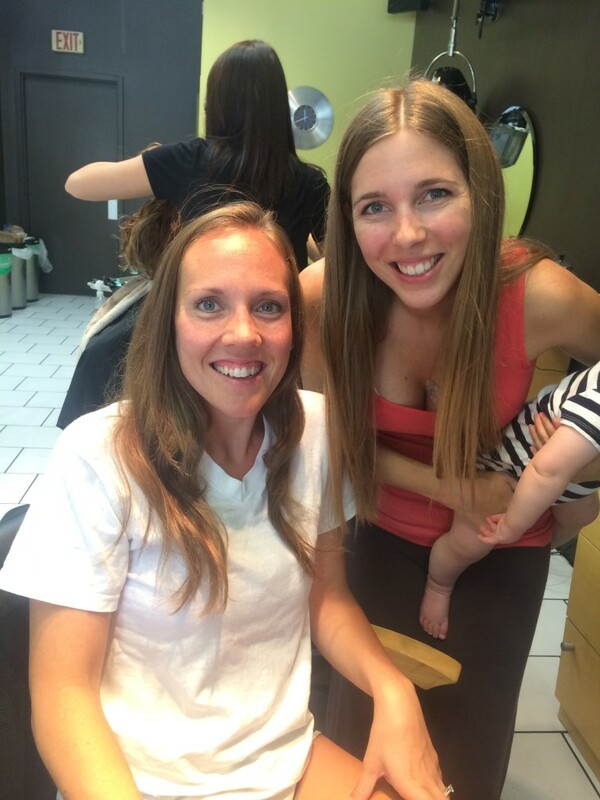 After a few recommendations, we had back-to-back appointments scheduled with an affordable stylist in town. Sneakily, we both decided to keep our plans to ourselves, not even telling our husbands. 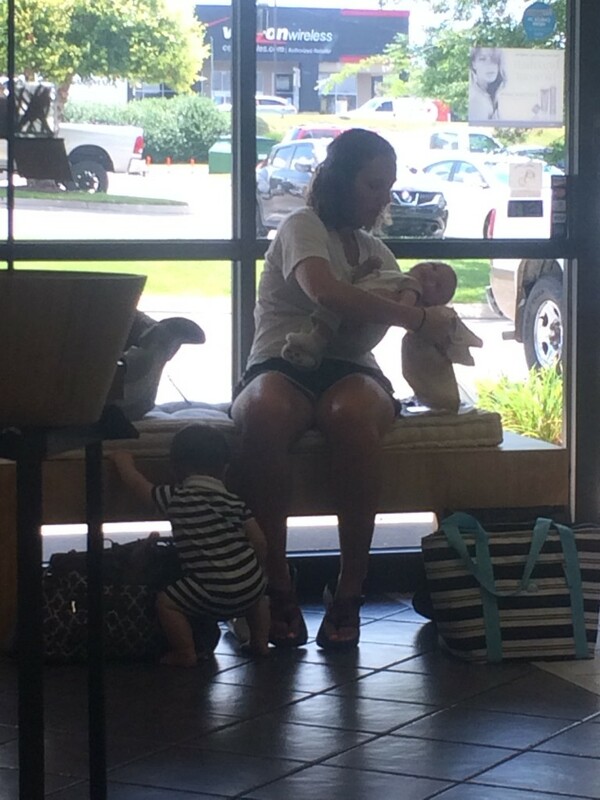 So last Tuesday we packed everything but the kitchen sink, and headed to the salon, babies in tow. 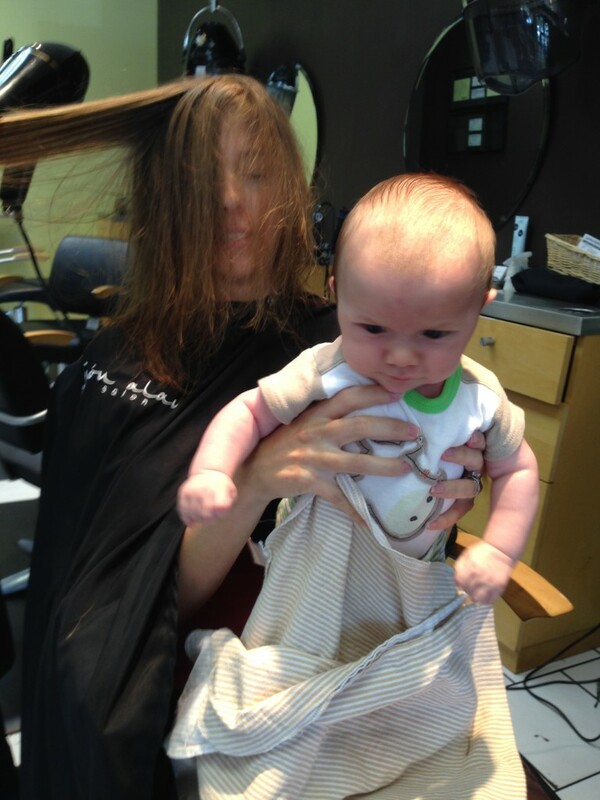 I would watch Silas and her 9 month old while she got her haircut, and then she would watch the babes. If cutting 9 inches of hair wasn’t enough of an adventure, watching those two kids in a salon lobby was. Details aside, we both went through with the cut and were pretty pleased with the overall experience, although next time we will opt for babysitters for sure. Knowing I had kept my plans a secret from Casey, I was anticipating the big reveal. I knew he was getting sick of my long hair being in the way and was going to love my new ‘do. Let me tell you, being a new mom doesn’t leave you with many opportunities to feel pretty, but this styled cut had me feeling that way. Now all I needed was a plan to surprise Casey, and capture his excitement. I knew he would be coming home soon so I positioned my phone just right to be able to capture the moment when he walked through the door. I touched up my look in the bathroom, hit record, and rushed into position as I heard the garage door open. What? Did I cut it? Are you kidding? I couldn’t help, but wear the disappointment and hurt right on my sleeve. It had been almost 3 years since I had my haircut. It was 9 inches shorter. I actually PAID to get this ‘do. I look good! Or at least I thought I did. I just knew he was going to think I did. And maybe he did, but his lack of enthusiasm or maybe his confusion, left me feeling ugly and unloved. Stupid. I know, but that’s what expectations can do to us. Clearly hurt, I told Casey what I had expected and how I was feeling. He did his best to sincerely apologize, but the moment was gone. There’s no recovering from that. He can’t erase it, go back in time, and rush in the door with a warm embrace and compliment. The moment was now covered with the image of him walking away while pondering if I had actually cut my own hair. So although I accept his apology, and totally understand how he just had his mind on something completely different when I caught him off guard, I’m still disappointed that the much anticipated moment was such a #fail. Have you ever had a disappointing moment like this in your life? I’m starting to see a pattern. A pattern I don’t like. A pattern I can’t figure out how to stop. Ashlynne was gone on Friday which meant Casey and I had time to ourselves. It seems like that would be a good thing, but the pattern that we can’t seem to break is fighting once she leaves. It’s like her being gone and us being alone gives us a new freedom to address issues whenever we want and brings us to a realization that things aren’t quite right. If you’ll remember, the last time she was gone was the time I ran away to the park. The time before that was the breakdown over a cancelled date to see the Steeldrivers. And so on and so forth. Every time we have one of these fights, I feel like we come out on the other side more emotionally connected and with a better understanding of each other. I even feel like we have a game plan of preventing similar blowups in the future, but I suppose I’ve been proven wrong. So Friday night started off rough before Ashlynne even left. In fact, things got rocky as soon as Casey got home from work. We ended up in a small disagreement that we were able to hash out before Ashlynne returned from softball practice. I was excited as I felt like we had recognized our disconnection and taken immediate steps to repair. Not the best repair we’ve ever had, but in my mind, we were reconciled. I guess I was deceived. It wasn’t an immediate blowup, but man did things hit the fan hard later that night. Everything was going quite well after our discussion. We were on a mission to come up with a game plan for getting the house packed over Spring Break so we sat down in front of my computer and made a list of ideas based off various articles I had found on Pinterest. Then we made a run to the liquor store for boxes and then Office Max and Big Lots for packing supplies. Not the most romantic evening, but it was nice time together. It wasn’t until we got in bed that things got bad. Sadly, our topic of disagreement was the same one as earlier. You know, the one I thought we had resolved. It’s a topic that has plagued our marriage almost from day 1: physical intimacy. We’ve had so many fights come from that topic that the thought of it can make me cringe. So the topic came up as were lying in bed. As we started to try and repair it was clear that this wasn’t going to be like any other fight. Casey was beyond angry and frustrated, and I was beyond hurt. It wasn’t a good combination and led to one of the most explosive arguments we’ve ever had. But you know what else it led to? A flood of honesty and transparency. Words were spoken that should have left our lips years ago. Our hearts were poured out in front of each other and for the first time, we were able to talk about physical intimacy in a new light, the same light. As we ended the night we hadn’t solved all of our issues or even this disagreement, but we had been able to draw closer together and reconnect. Although I am thankful for the progress we made through this fight, I can’t say that I’m not fearful that it leads nowhere. We seem to be stuck in this cycle of disconnection, disagreement, and reconnection with hopes of staying connected more consistently, but ultimately, we keep finding ourselves back at disconnection. It’s like we see the immediate results of a deeper connection, but it quickly fades as we flow back into our normal routine, back in to what’s comfortable for us, which often means our marriage isn’t a priority. Then it all blows up when Ashlynne goes away for the weekend, and the distractions are gone. Maybe next time will be different. Ashlynne will be gone for a full 10 days so that should give us enough time to establish some new routines and build on this emotional connection. That’s my prayer. In the meantime, we’ll be packing for our move to the new home. Did I mention we’re under contract? Let the chaos begin. It feels like spring. It’s early Sunday morning, and I’m wide awake thanks to this feisty baby in my belly and crazy vivid dreams. The windows are open. The air is warm, but there’s a cool crispness and thickness to it that tells of the rain and freezing temperatures that are on their way. I’m sad this warmth will be gone soon as I anxiously await the more consistent warmth of spring, but I’m thankful for these few days of relief from the chill. Rumor has it there are more to come this weekend. Every warm day is a reminder that Baby B will be here soon. Although my due date is still 3 months away, I know those weeks are going to fly by and before I know it, our beautiful bundle will be wrapped in my arms. 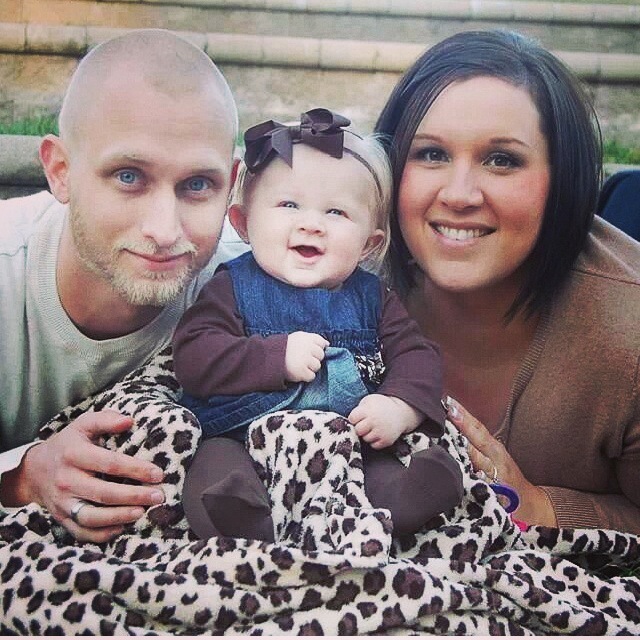 Speaking of kids, Ashlynne has been gone the last two weekends. Last weekend she was at church camp where she got to experience true fellowship with other young believers. This weekend is her time with her mom. We’ve missed having her here, but Casey and I really needed these last two weekends to ourselves. It’s no secret that we’ve been pretty disconnected and really struggling to find a way to continue to make our marriage a priority while focusing on becoming parents to Ashlynne. We’ve done a pretty decent job (praise God!) with the latter, but the former has suffered greatly. All of our disconnection and frustrations came to a head again last weekend. Finally some time together to talk, which meant stepping into the puddle. Both angry and hurting, it didn’t go well. In fact, it went so bad that I didn’t know what else to do, but run away. I disappeared to the local park and journaled for 3 hours straight while soaking up the sun. I was thankful to be alone and thankful for the sun. Not just because I needed its warmth, but because it gave me an excuse to wear sunglasses which was a much-needed shield for my tears. I poured my heart onto the page and sorted through months, maybe even years, of heartache, anger, and disappointment. It was brutal and left me with only one thing – prayer. There was nothing else to do, but pray. Eventually hunger called me home, or maybe it was the middle school boy’s birthday party that was slowly taking over the picnic tables surrounding me. Either way, I arrived home to find Casey on the porch with his friend, Ryan. I hid inside until Ryan left and Casey and I were alone again. He’d been complaining a lot lately about not hearing my heart so I made the decision to let him read what I had journaled. Maybe not the best idea I’ve ever had, but it seemed good at the time. He immediately disappeared to read through my multiple pages of pain as I prayed he would see my hurt and not his own inadequacies. What’s that thing about God not answering our prayers how and when we want? This was one of those times. The problem is that love does not equal service or a list of to do items. It doesn’t fix pain. It joins it and sits right in the pit with it. Even more, you can’t fake the heart behind it. As long as doing the dishes is a chore or a box on the checklist that’s the perceived gateway to physical intimacy, it can’t be called love. The most frustrating part of all this is that I think all of our counseling has made love a complicated word for us. But it was so easy, so natural when we were dating. No one had to give us a checklist or game plan because our loving actions came from an overflowing of our hearts. It was our desire, not our duty, to love one another well. Now don’t get me wrong, I am very thankful for all of our counseling. 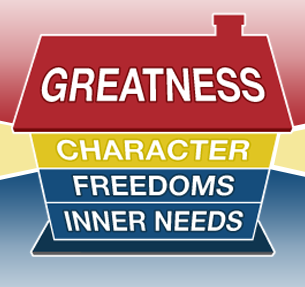 It has been and continues to be invaluable to us when it comes to emotional healing, communication, and conflict resolution, but a side effect is that it made love, pure and simple love, complicated. Although that Saturday was difficult, we stepped way down deep into the mud and eventually found each other there. And amazingly, we stopped trying to dig our own way out or bury the other person deeper; we simply joined hands and sat there together. Messed up. Muddy. Stained. Helpless. Crying out to our Loving, Almighty God to restore our love for each other and help us make our marriage a priority again. That was not how I wanted to spend our weekend alone, but we have reaped the fruit of reconciliation throughout this week through intentional connection, prayer and small moments that are full of love. This weekend was our first alone time in a while that wasn’t consumed by disconnection and repair. This weekend we saw how God had pulled us out of that mud pit, and we basked in the sun’s rays. Nothing fancy. Nothing even planned. Just pure, simple love. You know the greatest part about all of this? The most amazing part? It’s not that our marriage has yet again been renewed, it’s that a Mighty King that conquered the grave loves us enough to care when we’re stuck in the mud pit. And instead of standing high and mighty over us, condemning us for not being vigilant enough to avoid the hazard, He humbles himself, pulls up his stark white pants and steps into the mud with us, leading us out and then washing us clean on the other side. He could have just left us there. He could have given up on us. But He loves us more! No, we don’t deserve his recue and there’s nothing we could do to earn it. Yet he simply waits eagerly by for our cry for help and then joins us in our mess. Now that’s a Savior! 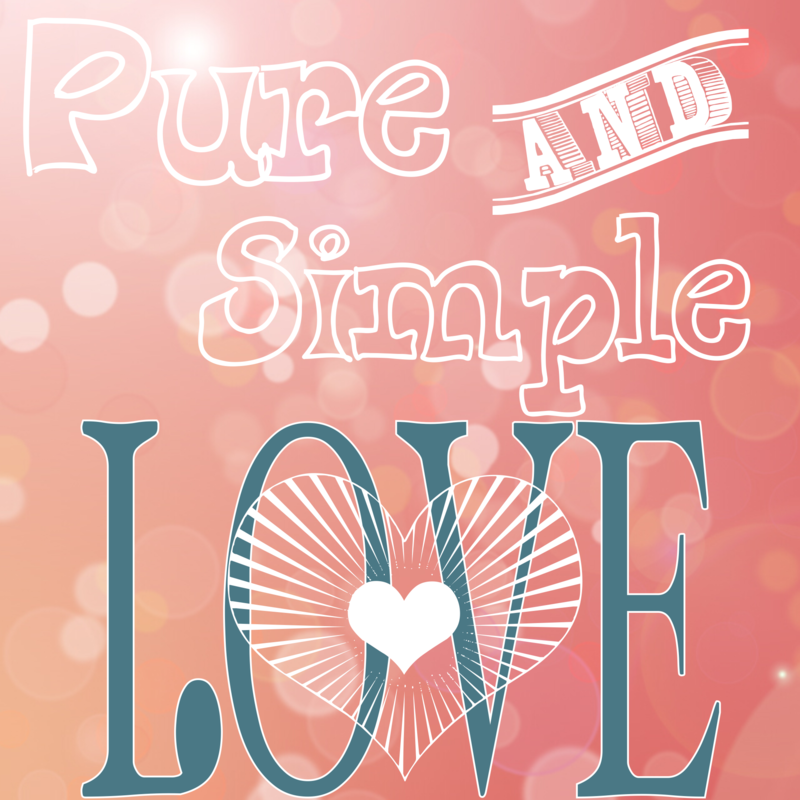 Yes, that is pure, simple love. Originally written on March 2, 2014.